There will be no big surprises here; the most effective exercises for massive gains are on the tip of your tongue, they are the biggest, heaviest, hardest lifts you perform in the gym, and they work. But why do they work? What muscles do they hit? Exactly why do they cause such a surge in growth? And are you doing them correctly? For many people, squats are the most dreaded of all lifts. The simple reasons for this are that they hurt like hell and they really take it out of you. Leg day can take some serious gearing up for, so double dose on the pre-workout and splash some cold water on your face, it’s time to get low! You need to dig up the old mantra ‘no pain, no gain’ because squats are the ultimate all-round leg exercise, as well as being arguably the greatest mass builder you can perform. 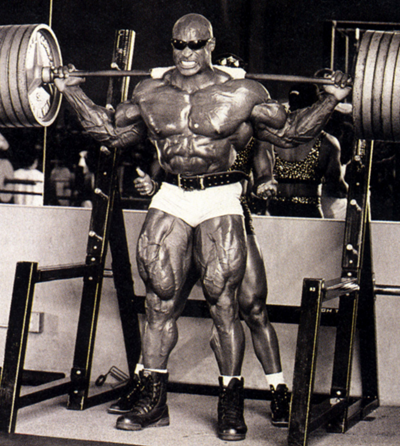 Some form of this revered lift must make an appearance in leg day if you want to build big, full legs. The primary muscles hit are the quads, but the rest of the lower body is also hit hard, especially the hamstrings, and the largest, most powerful muscles in the body, the glutes. The lower and central back take a hammering as well, and the core is worked hard in its intense stability role. Firstly you need to grip the bar at around one and half shoulder widths, then duck under it, settling the bar into your traps. Keep your shoulders back and your chest pushed out. Step under the bar with a shoulder width stance and unrack the weight by straightening up. You can play with your stance to hit the legs from different angles, but don’t go crazy or you’re just inviting nasty injuries in unspeakable places. Take a big breath, hold it, and steadily squat. Keep your head up and your chest out as you drop your hips backwards, keeping your knees in line with your feet. Ideally you should be able to see your toes past your knees as your thighs become parallel to the ground. You can break parallel slightly to make the lift extra strenuous, but going too deep places huge stresses on the knees. Breathe out hard as you straighten up, locking your hips to take another deep breath and go again. Another reason squats are such a great exercise is because the intensity of the lift causes a surge in anabolic hormones, such as testosterone and growth hormone. Taking Sheer Alpha Testosterone Booster will amplify this effect by stimulating your body to release more testosterone, the body’s greatest anabolic agent. Next on the list is another monster of a lift, and another massive testosterone booster, the deadlift. Deadlifts actually hit more muscles than squats. In fact, the king of lifts hits virtually every single muscle in the body in some way. The most worked muscle groups are the lower back, traps, and hamstrings, but everything from your Achilles tendons to your neck is blasted when performing deadlifts. This is also a great core strengthener and stabilizer due to the massive strain placed on these muscles throughout the lift. Deadlifts are also a leading cause of injury in the gym, from blown discs to stress fractured feet, so it is essential that your technique is absolutely spot on, especially when going heavy. Stand with a hip width stance and your toes under the bar. Bend down and grip the bar just outside of your legs. A double overhand grip is perfect, but alternating the hands as pictured provides more stability when the plates start to stack up. Without moving the bar, drop your hips back, bend your knees and touch it with your shin. Flatten your back, lift your chest, look ahead, and take a deep breath. Avoid letting your shoulders drop forward. Now stand up, driving through your heels, keeping your back flat, exhaling as you do so. At the top, drive your hips through and avoid letting your shoulders roll forward. Try to avoid using lifting straps unless you have absolutely no choice. Using straps leads to a weakened grip, which is a factor in many injuries of the wrist and elbow. Rounding out the big three powerlifting exercises is probably the most popular lift in the gym, the bench press. Hitting the pectoral muscles, as well as the frontal delts and triceps, the bench press is essential to building an impressive upper body. It is also one of the leading causes of injury in the gym, mainly due to people shoving huge weight on the bar before executing a poor lift that is packed with momentum. Put more simply, showing off! Lay on the bench with your head beneath the bar. With your feet flat on the floor (if you struggle reaching, try placing a disc under each foot) puff your chest out, digging your shoulder blades into the bench and allowing a natural arc to form in your lower back. Now firmly grip the bar. Don’t go for a wide grip, your forearms should be vertical at the bottom of the movement. Take a deep breath, dig your feet into the ground, set your body, and unrack the weight. Slowly lower the bar towards a point in your mid to lower chest. Do not bounce the bar. Breathe out powerfully as you press the bar back to the start position. Barbell bench press has been popular for many decades, and won’t be going anywhere anytime soon. However, using dumbbells actually trains the chest more thoroughly, while decreasing the risk of injury. This is due to the natural arc dumbbells allow, coming together at the top to work the inner chest. Performing big, strenuous lifts like the big three will cause a certain amount of muscle tissue to be used for energy. Taking Sheer BCAA will help to allay this by providing the body with the amino acids it would otherwise take from your hard earned gains. Pull-ups are one of those exercises that are as old as the concept of resistance training itself. What can be more simple than grabbing a bar, branch, or beam, and hoisting your bodyweight into the air? 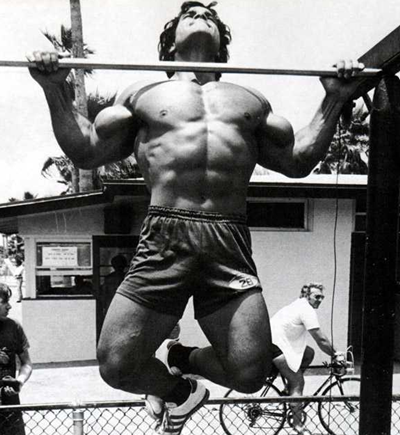 It is this organic simplicity, and accessibility that has kept pull-ups on the top rung for upper body development. Pull-ups work the upper back area the hardest, predominantly the lats and surrounding muscles. The biceps and forearms also get a good workout, as well as the rear delts. The core and muscles of the ribcage are blasted, mainly due to their isometric, stability role. Like all other lifts on this list, pull-ups involve a huge amount of muscle tissue, therefore inspire a huge amount of growth. Grip is often a talking point here, with the old saying ‘wide grip, wide back’ often leading the charge. While it’s good to vary your grips, it is actually a narrow, underhand grip that is more likely to add width, due to the wider range of motion it provides. In fact, a grip too wide places huge strain on the shoulders and elbows, so should be avoided. Another big back builder now, introducing the lat smasher that needs no introduction, the bent over barbell row. Hitting the back from a totally different angle than pull-ups, the bent row could almost be described as a reverse bench press. The barbell row works the muscles of the upper and central back the hardest, while the lower back is also hit, along with the biceps and rear delts. Dorian Yates (pictured) had possibly the greatest back ever seen, and he was an outspoken proponent of this top mass builder. However, Dorian liked to mix up his grips. He realised that by using a narrow, underhand grip, he could heap more work on his lower lats and traps, building a more complete set of wings. Give the underhand grip a go, it will feel strange at first but after a short while you will feel the difference. Don’t bend all the way over. Instead use an angle of around 45 degrees. This takes the strain away from the vulnerable, lower back, while piling pressure on the lower lats. At the top of the lift squeeze your entire back, arch upwards slightly, and hold for a one count. This ensures a full range of motion and more effective lift. This list finishes with the king of the delt builders, the overhead press. Destroying the lateral and frontal deltoid heads, while giving the triceps a good going over, and even putting pressure on the upper chest, there really is no better way to add width to your frame. But, steer clear of the old school behind the neck variety as it is a surefire way to destroy the underlying structures of the complex shoulder joint. Instead opt for a front press variation (pictured) or, better still, grab some dumbbells. As with the bench press, dumbbells allow for a greater range of motion and consequently a more thoroughly trained muscle. Dumbbells are also far kinder to the shoulders due to the more natural hand positions available. When shoulder pressing, try to keep your elbows back so more work is dished out to the lateral heads. You also need to ensure your shoulders remain down and back, or you risk transferring much of your efforts to the traps. Well, there you go, the 6 biggest mass builders. These exercises should form the core of your weight training. Together they work every muscle of the body to some degree, promote an anabolic environment, and give your physique great overall balance. After a tough workout, take Sheer Recovery to help your body prepare for the next session. This great supplement provides your body with array of key nutrients to kick start growth. The post 6 Most Effective Exercises For Massive Gains appeared first on .